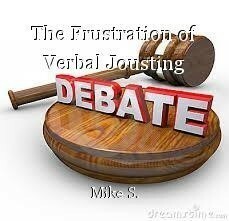 The Frustration of Verbal Jousting, essay by Mike S.
I just received a scary reminder of just how potent the Fox News Kool-Aid is. I got into a debate with a guy on a social media site, and he demanded proof of my assertion that Fox News News sometimes doesn't tell the truth to its viewers. So I Googled the topic, and came up with a long list of instances they had spread a falsehood. There were so many, that they couldn't all be sent, so I sent him six. He replied that they all came from 'liberal' newspapers, and so proved nothing. They were all things I had seen reported on television. I mean, the guy is so deep in the Fox Bubble, he thinks that most newspapers and any T. V. network but Fox News is lying. If his premise were true, I have visions of powerful men in 1,000 dollar suits all gathering at a restaurant and agreeing all to lie to make Fox look bad over cocktails and expensive steaks with rice pilaf. If we can't even agree a fact is a fact, how are we supposed to debate? Good question, Mike, to end a brilliant essay. I have these conversations all of the time. The distorted reality is quite amazing to me. Even the politicans are on different wavelengths. Mitch McConnell telling Democrats not to obstruct Trump's Supreme Court picks while he refused to call a vote on Judge Merrick Garland. Really? I feel like the two sides are really from different dimensions.